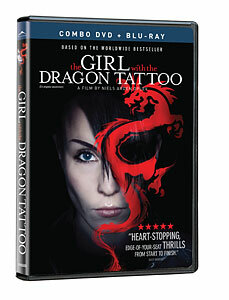 Alliance released The Girl with the Dragon Tattoo in a DVD/Blu-ray combo pack in Canada on Tuesday July 6, 2010. The Girl with the Dragon Tattoo (Director: Niels Arden Oplev): Though I’m not usually susceptible to the marketing hype that surrounds publishing “phenomenons” like the Harry Potter, Twilight, or DaVinci Code books, I do have a bit of a soft spot for Scandinavian crime thrillers. My initial enjoyment of Stieg Larsson’s book has cooled a little after reading the second in the series, but I still found it an enjoyable read. The film version, now more than a year old, has finally been released on DVD and Blu-ray in English Canada after a belated theatrical run earlier this spring. Strangely, Alliance released the film in Quebec in 2009, and I believe all three films in the “Millennium” series have already come and gone to cinemas in La Belle Province. My theory is that Alliance was waiting to see what was happening with the planned English-language (Hollywood) remakes, and decided there was still time to make a little money before those came out. I’m not being cynical. Foreign-language films are a hard sell in English Canada, even if they are based on hugely successful books. The timing of the DVD release coincides nicely with the theatrical release of the second film in the trilogy, The Girl Who Played With Fire, which opened here in Toronto this past weekend. But that’s enough preamble, what did I think of the film? Well, for such a plot-heavy book, The Girl with the Dragon Tattoo also manages to introduce an interesting cast of characters. Though journalist Mikael Blomkvist (played in the film by Michael Nyqvist) and hacker Lisbeth Salander (a chiselled Noomi Rapace) are clearly the focus, I enjoyed a number of the minor characters and felt that their relationships with Mikael and Lisbeth helped fill out the story. Unfortunately, with all the plot elements to cover, the film has dispensed with many of the other characters and even jettisoned some important storylines. For instance, in the book, Mikael is carrying on an open affair with his magazine’s publisher, Erika Berger, who at one point visits him at his cabin on the island of Hedeby. He also carries on a sexual relationship with Cecilia Vanger, a member of the extended family he’s investigating. These relationships provide some insight into Blomkvist’s personality and his self-image as a bit of a ladies’ man and add some tension to his budding relationship with Lisbeth. Both characters are in the film, but just barely. Lisbeth is a mysterious young woman with a troubled past. In the book, she has two important supporters. Dragan Armansky, the head of Milton Security, gives Lisbeth a job and looks out for her. Holger Palmgren is her appointed guardian and trustee before a debilitating stroke leads to his replacement by the sinister Nils Bjurman. Neither of these important characters appears in the film. These are unfortunate omissions, but I can’t say that they’re unexpected. The plot of the book is more than enough to fill out the film’s nearly 150 minute running time, but as a result, it rather simplifies the story, leading to an enjoyable film that fades from the memory much more quickly than the book. Granted, books are immersive worlds that can fill weeks of our lives at a time, so my quibbles are true of just about all book-to-film adaptations. I can say that I’m still planning to catch the second installment, hopefully while it’s still in theatres. Helpfully, Alliance has included a “sneak peek” look at The Girl Who Played With Fire on the Blu-ray portion of the combo pack, as well as interviews with star Noomi Rapace and producer Soren Staermose. Perhaps indicating the beginning of a trend, the special features are not included on the DVD disc. This entry was posted in DVD and tagged basedonthenovel, sweden. Bookmark the permalink.